Time for Christmas Cookies! Give them a bowl and let them mix and stir their "cookie dough" while you mix yours. Listen to their creative cooking - who knew there were stuffed bear cookies. 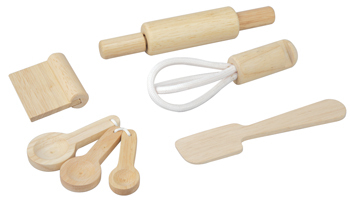 Set includes rolling pin, measuring spoon, whisk, pastry cutter and spatula. Made of recycled rubber wood. Rolling pin measures 1.4" diameter x 7.5" long.